FD-CPR is best performed with four rescuers: Rescuer 1 Rescuer 2 Rescuer 3 Rescuer 4. If you are short on manpower, these steps can be accomplished by two or three rescuers. If only two rescuers are available, then chest compressions should be delayed until the firefighter is removed from their gear. Rescuer 1 Drag the downed firefighter to a safe location to initiate care. Drag the firefighter from behind, dropping to the ground and positioning the SCBA bottle between your legs. Rescuer 2 Pop open the chest clip of the SCBA, if applicable, and initiate high quality compressions thru the turnout gear jacket. If the turnout coat can be easily opened, Rescuer 2 can quickly expose the top half of the chest at this step to improve the quality of CPR. Rescuer 1 If the SCBA mask is still in place, open the SCBA bypass valve. This step can also be performed by Rescuer 2 before beginning CPR. Rescuer 1 Remove their helmet, mask, and hood. Be sure that the hood is clear of the downed firefighter's chin, as this may cause them to become hung-up during the "pull down". Rescuer 3 Start to unbuckle the turnout gear jacket from the bottom up. Rescuer 1 Rescuer 3 Loosen shoulder straps of the SCBA and position the arms of the downed firefighter above his/her head. Rescuer 1 Rescuer 3 Work the zipper (or buckles) of the turnout gear jacket open. Do not interfere with chest compressions. Rescuer 1 Grasp the turnout gear jacket and SCBA shoulder straps of the downed firefighter firmly. Prepare for the "pull down." Be sure to work the hands free of any wristlets built into the turnout coat. Rescuer 1 may also need help holding the arms of the turnout coat. Rescuer 3 Rescuer 4 Pull the downed firefighter toward his/her feet and out of their turnout gear jacket and SCBA. 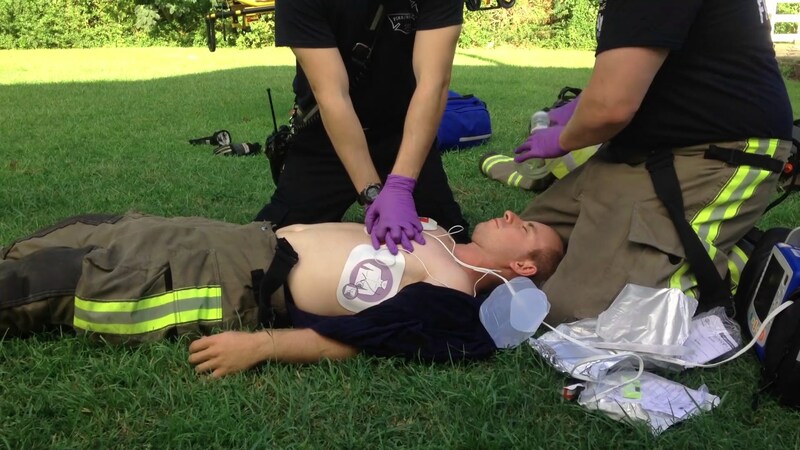 All Rescuers Begin a comprehensive resuscitation bundle focusing on minimally interrupted chest compressions. This step is the most appropriate time for a pulse check and application of an AED or cardiac monitor. ALS procedures should be delayed until adequate resources are available for high performance CPR.